Daen Seeth is the eastern region of Stonefalls. The city of Davon's Watch occupies most of the northeast, and Fort Arand lies on the southwestern border. The town of Senie is near the middle of the region. The Daen Seeth Dolmen is on the coast in the northwest, northeast of Ebonheart in the Zabamat region to the west. 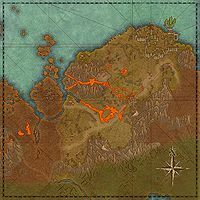 Bal Foyen borders on the east, while Deshaan is to the south, but there is no pass here. These side quests count towards the Stonefalls Adventurer achievement. For Pact storyline quests which also contribute to this achievement, please see Stonefalls Quests. Close the Scamp Caves: Stem the tide of scamps at Ash Mountain. Decree of the Court: Pay a toll of flesh or silver to the Blackfeather Court. Desperate Souls: Help free a group of Argonian slaves from Oblivion. Enslaved in Death: Help put spirits to rest. Exquisite Tears: "Procure" a bottle of rare wine. The Fate of a Friend: Find out what happened to an Ashlander's lost friend. Giving for the Greater Good: Collect a kwama cap to help Argonians restore the Starved Plain. Percussive Ranching: Help a kwama farmer gather his herd. Proving Trust: Aid a town in the wake of a volcanic eruption. Quieting a Heart: Help a woman speak to her deceased lover one last time. A Son's Promise: Help a son find his missing father. Suspicious Silence: Investigate the Covenant troops massing near Fort Arand. Through the Aftermath: Decide how to handle an army of Chimer soldiers. The Venom of Ahknara: Rout the Covenant assassins infiltrating Fort Arand. Wayward Son: Learn the secret plots of the "Circle of Mages". The Wizard's Tome: Help recover a stolen spellbook. Lava Foot Stomp: Celebrate the New Life Festival with the Dunmer of Stonefalls. ​ The Death of Balreth 5 Destroy Balreth and return the Brother of Strife to slumber. This page was last modified on 16 February 2019, at 10:45.